It is absolutely amazing to see the obedience that relatively unintelligent animals often performed at the bidding of the Saints. The lives of the Saints are full of stories pertaining to the extraordinary influence of the Saints over many different kinds of animals. God, it seems, allows the Saints to have this extraordinary rapport with the animals, so as to draw their fellow man closer to Him by marveling at the wonders that He works between the Saints and the animals. Below we have three such stories- St John Bosco and the mysterious dog "Grigio", St. Joseph of Cupertino and the story of the little goldfinch, and Father Paul of Moll and the beautiful colored messenger birds. Among all the amazing episodes in the life of Don Bosco, one of the greatest was the appearance of the dog "Grigio" -a huge grey dog that appeared suddenly at moments of danger, reappeared on many occasions and disappeared some years later when the danger was over. 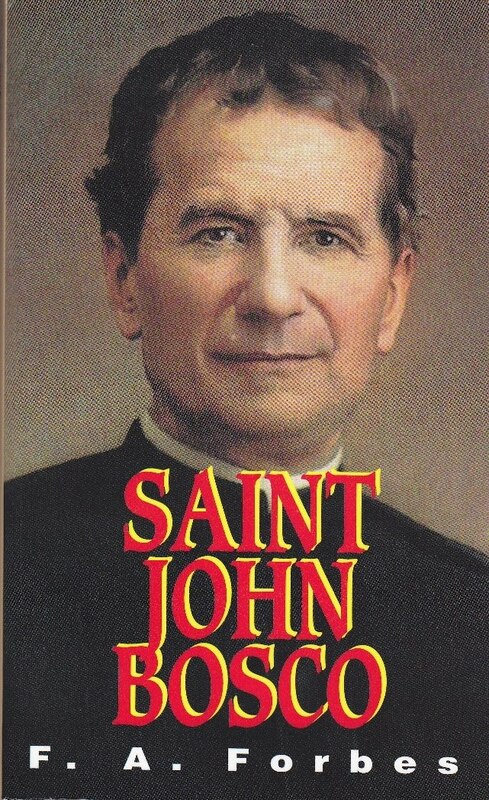 He asked for neither food nor shelter, was savage as a wolf against an enemy, but gentle as a lamb with the boys of the Oratory, and whom St. John "Don" Bosco gave the name of Grigio -"the grey one." Don Bosco was once passing through the thickly populated quarter which lay near Valdocco late at night. It had a bad reputation: shady characters could skulk behind the tufts of scrub and brushwood and burst our upon the passerby. His mother, Margaret Bosco, was always anxious when her son was our late at night. Don Bosco had passed the last buildings of the town when a huge grey dog appeared and walked by his side. He was startled at first, but as he found that the creature seemed friendly, he accepted its company and went on to the Orarory. When he reached the door the dog turned around and trotted off in the direction whence it had come. Every night henceforward, when Don Bosco was out late, the same thing happened. He found the dog waiting for him whenever there was a lonely part of the town to be traversed. One night, he became aware of two suspicious-looking men who were following him, matching their pace to his. When he tried to avoid them by crossing the road, they crossed too. He decided to rum back, bur at the moment he did so they were on him. A cloak was thrown over his head and a handkerchief thrust into his mouth. He struggled to free himself and call for help, but it was useless. Suddenly, with a terrific howl, Grigio appeared and rushed upon them. Leaping on the one who held the cloak, he forced him to let go, then bit the second and flung him o n to the ground. The first tried to escape but Grigio was after him, rolled him too in the mud and stood over them both, growling furiously. "Call off your dog!" they cried to Don Bosco. "I will call him off if you will let me go about my business," he replied. "Yes, anything..only call him off!" "Come, Grigio," said Don Bosco, and the dog immediately obeyed, while the two men, terrified, made off in double quick time. Another night, Don Bosco was on his way home when a man hiding behind a tree fired twice at him at such close range that it seems almost impossible that both shots had missed. Then, throwing away the pistol, the man rushed upon him. But at this exact moment, Grigio mysteriously appeared and seized the man, and dragged him a few feet away, growling fiercely all the while. He then released the man who instantly fled in terror, and the dog once more escorted Don Bosco home. On another occasion it was from a whole band of thugs that this mysterious companion saved him. Don Bosco had reached a lonely spot when, hearing steps, he turned to see a man close to him with an uplifted stick. Don Bosco was a swift runner in those days, but his enemy was swifter and soon caught up with him. It was a moment of action. Don Bosco, with a well-directed blow of the fist, sent the man sprawling. His howl of pain brought several others out of the bushes where they had been hiding. They were all armed with heavy sticks, and things now looked black for Don Bosco. Once more, at the crucial moment, the terrific howl of Grigio was heard. 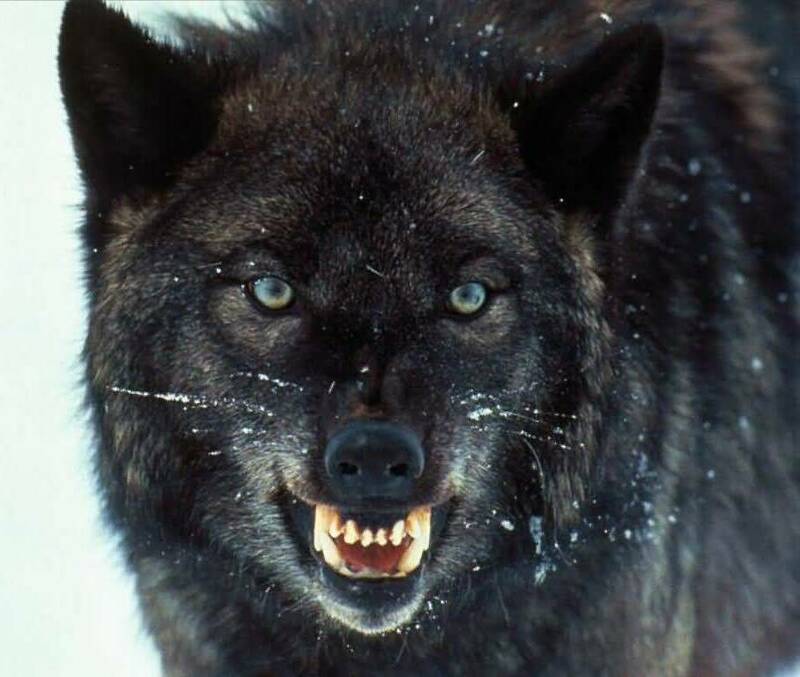 He ran around and around his master, growling and showing his formidable teeth until one by one the ruffians turned and disappeared. One night, instead of accompanying Don Bosco, Grigio went to the Oratory and refused to let him go out, lying down across the door of his room, for once growling and showing ill temper towards Don Bosco when he made the slightest attempt to dislodge him. "Don't go out, John," said his mother; "if you won't listen to me, at least listen to that dog; he has more sense than you have." 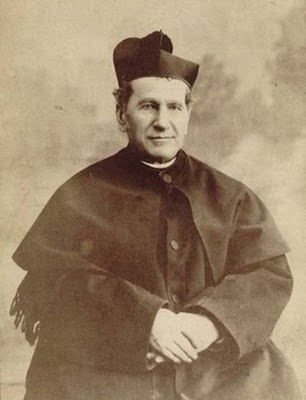 Don Bosco gave in at last, and a quarter of an hour later a neighbor came in to warn him that he had overheard two rogues planning to attack him. Another evening after supper the dog appeared in the playroom, and all the boys of Don Bosco's Oratory gathered around him and made much of him. They patted him, pulled his ears, stroked his head, the little ones rode on him. He regarded them with grave eyes until at last they brought him into the refectory where Don Bosco was still at supper. "Why, Grigio, old fellow, what brings you here?" he said. Grigio went up to him, put his great head on the table, looked at him and wagged his tail. "What do you want, old boy? A bit of cheese or polenta?" No, he wanted neither. "Then, if you won't have anything," said his master, stroking the great head, "then go home to bed." Grigio gave him one long look, turned around and trotted out. The reason of this unusual visit of Grigio was never really known, but it does show the remarkable gentleness and kindness of this "stray dog" who was nevertheless incredibly vicious and protective of Don Bosco on numerous occasions. The last time Don Bosco saw him was one night in Castelnuovo. He was going from Murialdo to Moncucco and it was growing dark. He had to pass some farms and vineyards that were guarded by savage dogs. "I wish I had Grigio here," he said to himself. As if the wish had suddenly produced him, Grigio appeared with every sign of delight at meeting his friend, wagging his tail, and he walked the whole way with him. It was lucky he was there, for two dogs at a farm they passed rushed out upon them, but Grigio in a vicious offensive soon sent both of them flying with their tails between their legs. When Don Bosco reached the friend's house to which he was bound, they were astonished to see the magnificent dog and wondered where Don Bosco had picked him up. When they sat down to supper he was lying beside them, but when Don Bosco rose to give him some food, he was not to be seen. In fact, that was the last of Grigio. The enemies of the Saint had grown tired of plotting against him, and the mysterious protector was never to be seen again. So how can the incredible timing and actions of "Grigio" the stray dog be explained? How is it that he mysteriously showed up at just the right moment on not one, but numerous occasions to literally save the life of Father John Bosco? Was Grigio an Angel in the form of a dog? Or was he simply a dog that was mysteriously guided by God to protect Don Bosco? But how then did he seem to appear out of nowhere? One thing is for sure: God was with St. Don Bosco because he had long ago given himself completely to the service of God, and God worked incredible miracles through his intercession, that he might be a holy example to all the poor boys who came to the Oratory that he had founded which literally became for them a heavenly refuge. But before we move on to the next Saint who had a remarkable way with animals who should surely at least mention probably the most well known Saint to have an extraordinary friendship with the animals: St Francis of Assisi. 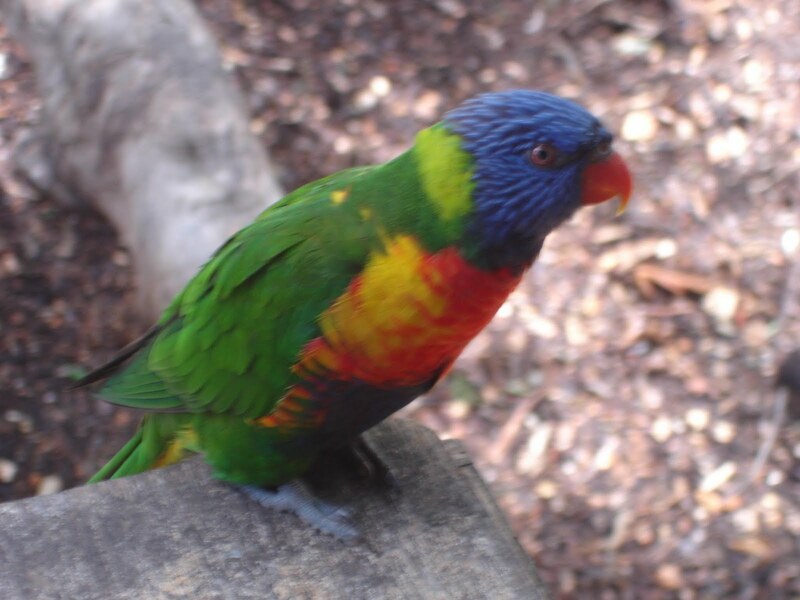 It was documented on numerous occasions how the birds often flocked to him, and landed on his arms and shoulders, singing sweetly all the while. He spoke to them, and they responded by singing and fluttering their wings. One can read on the Internet the book entitled “The Flowers of St Francis” which details many of the Saints remarkable experiences with nature. 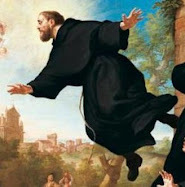 Through the grace of God, St Joseph of Cupertino worked various marvels with the animals. A linnet, to which he often said, "Praise God," would praise the Lord or cease to do so at his command. 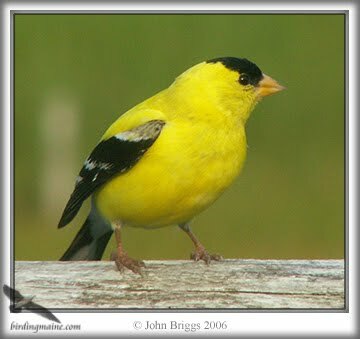 Once, on setting free a gold-finch that had been caught in a fowlers net he said to it: "Go now and enjoy what God has given thee; I ask nothing more of you than that you return when I call you to praise with me your God and mine." Obedient to these words, the bird flew about in the garden near by and, when Joseph called it, it immediately would come straightway came to praise the Creator. 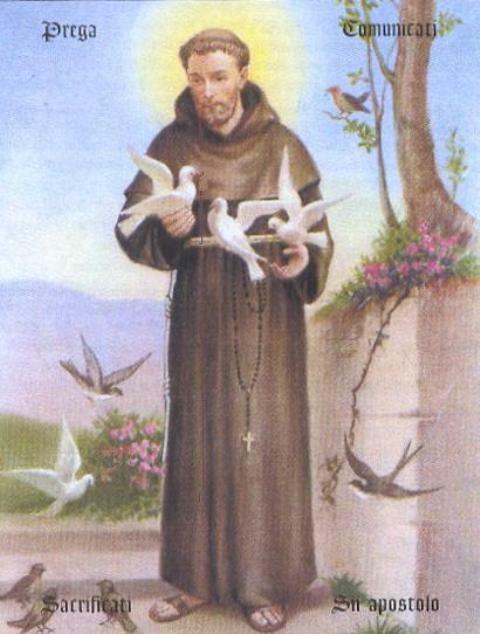 A hawk once killed a finch, which the saint had trained to say, "Jesus and Mary” and also "Friar Joseph, pray your Breviary." The hawk returned at the saint's command and, when he reproached it saying, "You, thief! You have killed my finch and you deserve that I should kill you!" Amazingly, the hawk remained perched on the cage as if sorry for its misdeed, and the witnesses state that it even allowed Joseph to strike it with his finger, and only flew away when he said, "Now go. This time I will pardon thee, but do not do such a thing to a pet again." To the nuns of St. Clare at Copertino the saint presented a white lamb to watch over the discipline of the community. The lamb always was with the Nuns during their spiritual exercises and was ever alert in the Chapel to wake the sleepy by butting and jostling or to remove with hoofs and teeth any vain finery which it observed. When the lamb had died, the saint promised to send the nuns a bird which should prompt them to love God, and thus it came to pass. One day as the nuns were reciting the Divine Office, a forest songster perched on the window of the choir and sang most sweetly. And thus day by day the merry warble of the feathered songster accompanied and encouraged the chanting of the nuns, until one day it saw two novices quarrelling and flew between them in an endeavor to part them with its outspread wings and tiny claws. One of the novices struck the bird, and it flew away and did not return, though it had been with the community for five years. The nuns were grieved because of this and complained to Joseph, but he said: "It serves you right; why did you provoke it and chase it away? It is therefore unwilling to come again." But, at their repeated request, he promised to send the bird again. At the first summons to choir, the bird not only came to the window and sang, but, grown more tame than before, and flew into the monastery. The nuns tied a small bell to its foot. 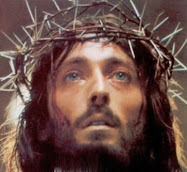 When it failed to appear on Holy Thursday and Good Friday, they again had recourse to Joseph, who replied to them: "I sent you the bird that it should sing, not that it should ring a bell. It has stayed away because during these days it has guarded the holy sepulchre. I will see that it comes back again." And the bird returned once again and remained with the pious nuns until its death. The saintly Father Paul of Moll , who is known as "The Benedictine Wonder-Worker of the Nineteenth Century," also had a mysterious experience with birds. We are told in his biography that whenever he visited Antwerp he would call upon a certain invalid lady and her servant, Theresa. Fr. Paul, in the year 1887, told the servant Theresa that she would know beforehand of his approaching visits. At his next visit he asked, "Well, have the little birds announced my coming?" Not only did the servant, Theresa, see the birds, but also the invalid lady and her nurse. Neither of them could tell where the birds came from any more than Theresa could. But were the birds from the tropics? But in that case these delicate little creatures would hardly have ventured into our climate in all seasons, for they came in winter, when it was snowing and very cold, as well as in summer. The nurse tried repeatedly to catch one of the birds, but in vain. She spoke of it to Fr. Paul and he replied, "Oh! they won't let themselves be caught!" Another lady of Antwerp was favored with a visit of Fr. Paul. She had two small sons who were covered with horrible eruptions which the doctors could not cure. When Fr. 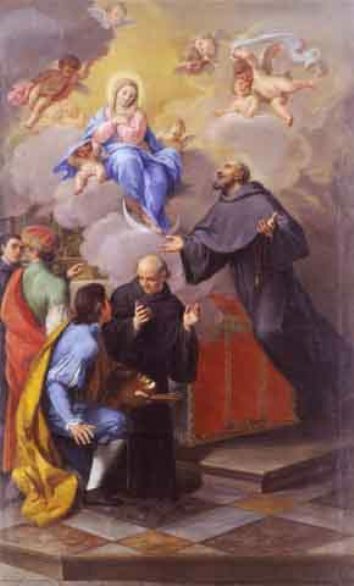 Paul saw the condition of the children he advised the mother to make a novena and wash both children with water containing the medal of St. Benedict. Fr. Paul was a promotor of the medal of St. Benedict and often advised this remedy to those who were ill. The mother was surprised by this advice and replied, "But the physician forbade me to wash them in water." Fr. Paul repeated his advice, "I tell you, wash them twelve times a day for nine days." Before the end of the novena both children were perfectly cured. 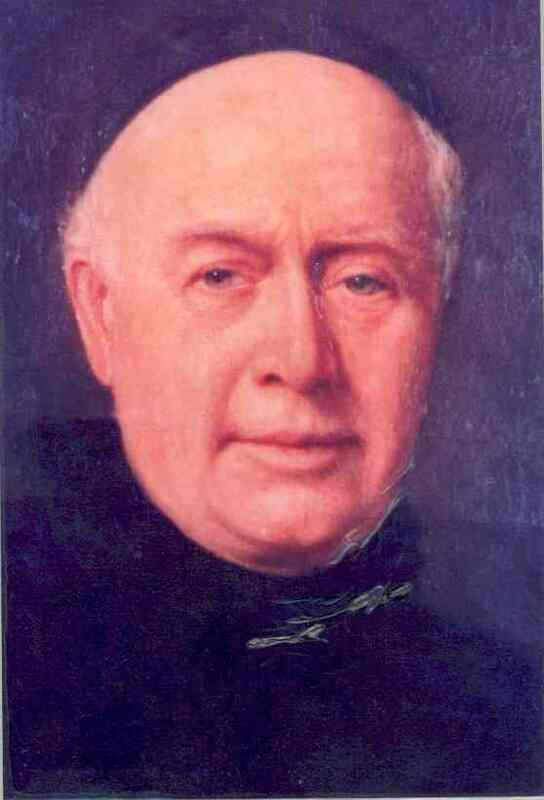 This is just one of the countless miracles worked by Father Paul of Moll, "The Benedictine wonder-worker of the nineteenth century." 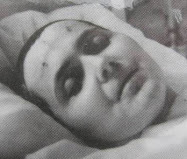 The same woman tells us, "I have visited the grave of Fr. 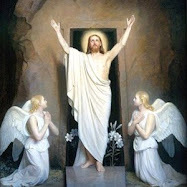 Paul three times, and on each occasion a beautiful little bird came and sang over the tomb as long as I prayed there. The bird did not fly away until the moment I left." -"The more a man loves God, the more beautiful he grows in the eyes of God." -"God being infinite love, we can always love Him more and more." -"Oh love! Oh infinite love! Oh eternal love! Oh sweet love of God !" -"Man finds his greatest consolation in faithfully keeping the commandments of God and the holy Church, and in having a great devotion to Mary." WOW! What a facinating article! 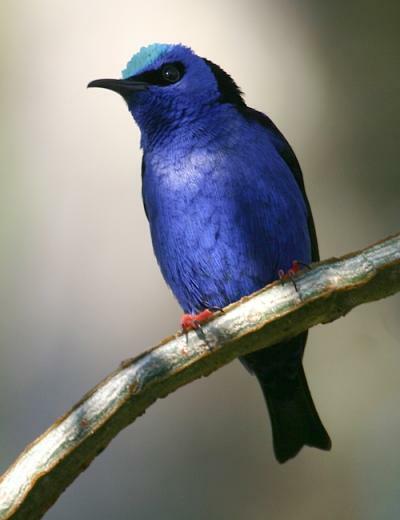 I especially love the part about Father Paul of Moll and the beautiful little birds! It is very uplifting to see how God works signs and miracles through the saints! Don't forget about St. Paul the first hermit in Egypt and the two enormous African Lions who came everyday to drink and get petted and his blessing. When St. Anthony the great found St. Paul dead, the lions dug a grave for him in the sand after sniffing him, then waited for St. Anthony to bless them. Hi Glenn-I see that you have a new 'Saints site'! Very cool! The stories of St. John Bosco and the mysterious 'Grigio' are great! I'm a dog lover myself, as you know from my profile at the end of the Blessed Dina Belanger article that I did for you a few months ago. 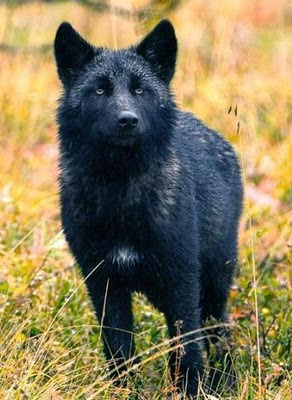 I like the 'wolf pictures', too. This is one time when a dog truly WAS a 'man's best friend'! Saint Rocco was saved from dying of starvation during the plague in Italy in the 11th century by a dog that brought him bread each day of his illness. And not only saints are saved by dogs. There are many stories in the papers about beloved pets saving the lives of their owners - from house fires; illnesses or strokes (once by dipping a towel into the lavatory to keep the owner alive with water for days until help arrived - without instructions); children from drowning; and the list goes on. What a wonderful site! I am so blessed to have stumbled upon it. God must be quite pleased. Praised be Jesus Christ now and forever! -Thanks so much for your comments. There are certainly many others that could be added to this list...like the crow (or raven) that God sent to feed Elijah the Tishbite by the brook Cherith during a long drought (1 Kings 17:6). It is great to hear from you. Yes, this website is one of my more recent creations, along with the "Miracles of the Church" website.....However, I am still building the "Mystics of the Church" and "St Gemma Galgani" websites also, and I am really enjoying them all! (in the comment section at the bottom of the article). Hi Glenn-thanks for letting me know about the newest comment on my Dina Belanger article. I went over and read it. There's another animal story with regards to the Saints. This one was in Scotland. I think it was St. Giles, whose name is on the Protestant Cathedral in Edinburgh. He was living as a hermit in the woods when a hind [another name for a deer] was running away from a group of hunters. The deer sought refuge in Giles' cave, and it protected him from being shot at by the hunters' arrows. Because of this, the hind and the arrows are St. Giles' emblems in art. I forgot about St. Rocco [Roch] and the dog who saved his life! There's another 'dog and Saint' story as well: St. Margaret of Cortona was living in sin with a nobleman in his castle in Italy. He went out hunting one day; and when he failed to return, his dog came back to let Margaret know in his 'doggy way' that something was wrong. The dog led her to a spot in the woods, where it dug under a pile of leaves. The dead body of her paramour was found, murdered. This was the cause of her conversion. She left the castle with the son she had by the nobleman, she became a penitent in the Third Order of St. Francis, and became a Saint! There is a statue of St. Francis in Assisi surrounded by a grate so that no one can touch the statue. It is open only at the top. Doves continually come to land on the statue as if protecting him...I felt blessed just to witness this fascinating scene. Just a simple question for everyone here: how old is the earth? To reply to your question, the Catholic church has NEVER speculated or even ventured a guess in reagrds to the age of the earth--The Church leaves such matters to the scientists. One thing is for sure, those christian denominations and individuals that speculate and say that the earth is such and such years old ARE WRONG to make such a pronouncement because the Bible (for which they base such speculations)is NOT a science book and the Holy Scriptures were written with the only concern being spiritual matters for the salvation of souls. So, to answer your question, the Catholic church has no opinion as to how old the earth is. Through negligence on my part with no malice I caused the death of an animal I went to confession and the priest made light of the event, is that because the church doesn't believe animals have souls or because he could see how deeply sorry I was? Yes, the Church teaches that while animals have a spirit and a body, they do NOT have a immortal soul. Also, we read in the Book of Genesis that animals were created to be at the service of man, for food and to help with work etc. 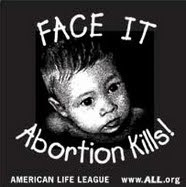 yet they are to be cared for with respect, because they are creatures of God. Nevertheless, if you inadvertently caused the death of an animal through negligence their is no *serious* sin involved, because it was not done maliciously. For sure your sorrow and contrition for the incident and the fact that you formally confessed this incident you can be assured at this point that God has forgiven you, and that the incident was not a matter of serious sin. The otter that rescued Kevin's breviary from the lake and brought him fish also brought fish for his monastery. A Blackbird laid an egg in his hand during Prayer. He stayed in prayer until the egg hatched. The King of Colmans’ baby needed milk, and the King asked Kevin for help. Kevin prayed, and a Deer arrived from the forest to provide it everyday. At one point, a Wolf killed the Deer and Justin chastised the Wolf. The Wolf then began to bring the milk himself. I always loved the story of St. Columba and the 'friend' he told his monks about that was coming in from a long journey and would need rest. Turned out the friend was a bird that had got caught in a storm and was exhausted from flying and landed on the isle of Iona. They nursed the bird back to health. I have knowledge of theses things as well usually I know before they come.I also have the ability to communicate with the WHAT A GIFT IT IS. Those who do not believe in such miracles just have to understand that there are events that do not give in to logic and explanation, and that is what they are called miracles.